Here is a collection of select coverage from film festival premieres this year. In what has become the fictional relationship version of Michael Apted's "Up" series, Richard Linklater's "Before" films have foregone the itch of seven years to revisit his primary couple every nine. In 1995's Before Sunrise, they met on a train and spent the night falling in love. In 2004's Before Sunset, they reconnected and ended up seemingly happily ever after on one of the great fadeouts in movie history. In 2013, Ethan Hawke's Jesse and Julie Delpy's Celine are still together, still in love, but about to confront the real-life consequences of their whirlwind fantasy romance. By the time this trilogy comes to its most fitting end, we realize that it may have been premature to label any other fadeout in this story as perfect. Summer is coming to an end for the couple where they have spent their time at the invitation of a local writer. Jesse sending his son back home to his mother is the catalyst for a lot of unresolved real-world issues such as fatherhood, employment, divorce and location, location, location. Like many couples they are able to discuss such matters through the prism of suggestive passive aggression but delaying it long enough until it comes up at the worst time. In-between they continue to find interesting deductions on life's everyday mysteries and even walk-and-talk their way around whether their love was merely a product of their youth and if that spark and passion will still exist into their advancing days. What begins as almost as an existential fantasy involving island strangers, a tree-bound boat and a mystery woman becomes something much more conventional but no less engrossing. Writer/director Jeff Nichols jumped onto the critical radar with 2011's Take Shelter, a film which I found to be a pretty standard "crazy-guy-knows-more" dramas with a cheat ending. Mud is more in line with Nichols' terrific first film, 2007's Shotgun Stories, which had plenty of plot to go around but also was about greater themes involving family, letting go and revenge. This is the film that truly delivers on that debut. Two young boys, Ellis (an excellent Tye Sheridan) and Neckbone (Jacob Lofland) want to claim the aforementioned boat for themselves on a nearby Arkansas isle but discover it is already being inhabited. 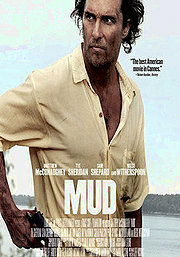 That stranger, identifying himself as Mud (Matthew McConaughey) tells them that he is waiting there for his true love to return and asks for their assistance in getting that boat in the water. Thus begins an adventure for the boys which starts as a project but becomes a complicated game of cat-and-mouse that weaves them through Mud's past, Ellis' present and an uncertain future for everybody. 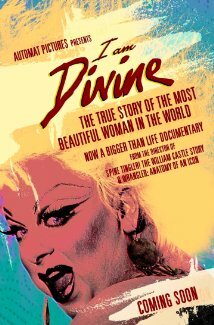 Along with the many narratives to be found at SXSW, one can always count on their selection of documentaries. Especially as they feed into the music portion of their festival and there have been some terrific ones over the years. One worth checking out this year is the story of Kathleen Hanna, the lead singer of female punk band Bikini Kill. (You may recognize their "Rebel Girl" if you have a weird mind like mine and remember Not Another Teen Movie. (http://www.youtube.com/watch?v=mZxxhxjgnC0)) Hanna developed a fanbase crafting lyrics for a feminist movement that was believed to be dying in the early '90s and was a prominent figure in the underground punk scene until 2005 when she suddenly walked away from the stage. The mere mention of Harmony Korine's name is enough to send most cinephiles running for coveror at least into the nearest shower. The writer of the infamous 1995 Kids last directed the 2009 festival film, Trash Humpers, a docu-style film about folks in old-age masks that, well, humped trash cans. So lovely. Before ever premiering at last year's Toronto Festival, Korine's latest opus had already received a healthy dose of press thanks to the multitude of stills released containing its primary cast in striking bikini poses. As the cast included previous PG-rated teen stars Selena Gomez, Vanessa Hudgens and Ashley Benson, one could only grossly imagine the paces the NC-17 auteur would put them through. Most shocking of all is that while Spring Breakers takes some time to find its bearings, this may be the most confident and artistically-grounded film of Korine's career. A foursome of college students (also including Mrs. Korine, Rachel) decide to head to Florida for the most obvious of teen rituals. Without a stake of extra cash to fund their excursion, they decide to execute a robbery on the way down. Though Gomez's Faith becomes increasingly detached from the immorality growing around her friends, the others begin adapting to it. This disconnect is further enhanced when the group are arrested at an out-of-control party and bailed out by local drug dealer, Alien (James Franco). Treating them practically like pets, the girls become further seduced by a lifestyle that college has no course for and yet are just smart enough to use what God gave them to give them the upper hand. The anthology V/H/S was quite the hit with the Sundance midnight crowd when it premiered just last year at the festival. As a part of that first crowd, I was generally underwhelmed with the enterprise. With the nature of horror anthologies being what they are (each has to end with a shocking or ironic twist) there was very little to surprise. Sure the fourth segment involving the background goings-on of a Skype conversation was clever and fun, but the wraparound story was dumb, the first segment had moments but succumbed to obvious expectations and Ti West's section was flat awful (a distinction he continued by being the worst of 26 films in The ABCs of Death, a more consistent anthology effort.) Even with less than enthused expectations, the sequel (retitled from the more clever S-VHS) had room for significant improvement and it is a pleasure to report that this film delivers the goods in a far more impressive manner. At least part of the time. The wraparound story is only slightly less dumb this time around and the first segment (by Adam Wingard) about a guy with a bionic eye that records everything is mostly just noisy jump scares without taking full advantage of a potentially clever twist on found footage. Though, admittedly, it does boast one of the best (if most superficially pleasurable) solutions to getting ghosts to go away. The fourth segment (by Hobo with a Shotgun's Jason Eisener) also starts with great potential involving kids pranking their older sister and her friends but turns into an uninspired home invasion story that doesn't live up to its own title. (Don't look it up if you want to avoid spoilers.) In the middle of all of this though is what makes V/H/S/2 so worthwhile. Every once in a while a horror film comes along that builds up a reputation long before the public gets their first look at it. They occur on the festival circuit (usually at one of the majors) where enthusiastic midnight crowds and the write-ups of their reaction tend to overhype what is really on the screen. Maybe because horror is a genre we really want to have a breakout success to bring more respect to it in-between the myriad of uninspired gorefests and under-reaching found footage borejobs. While I am often at many of these midnight screenings and witness firsthand a crowd's loud appreciation for a big kill or a shock, I am there looking at the film and not the experience. I'll be damned though if at the debut screening of Adam Wingard's You're Next at Toronto in 2011 I wasn't joining in on all the fun. As if the world of horror needed another home invasion story. Though if you stop to think about many of the most positive horror experiences over the years (i.e. 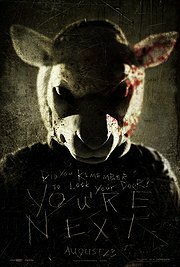 Them, its American "remake, The Strangers and Kidnapped) have been just that. The premise starts simple enough. A family reunion takes place at a big country house consisting of many of the stars of this generation's dubbed Mumblecore repertoire (Joe Swanberg, Amy Seimetz, Kate Lyn Sheil, etc...) One of the sons has brought his new girlfriend (Sharni Vinson) along to meet the family, just in time for a trio of arrow-wielding terror-mongers crash the party and start offing guests. But there's more. So much more.